A Star is Born. Warner Bros.
the tragic Hollywood star (Judy Garland, Marilyn Monroe, Elvis Presley, etc.) in biopic or documentary form. Fictionalized versions of the Tinseltown tragedy usually follow the model of A Star Is Born, a tale that was originally produced by David O. Selznick in 1932 as What Price Hollywood? 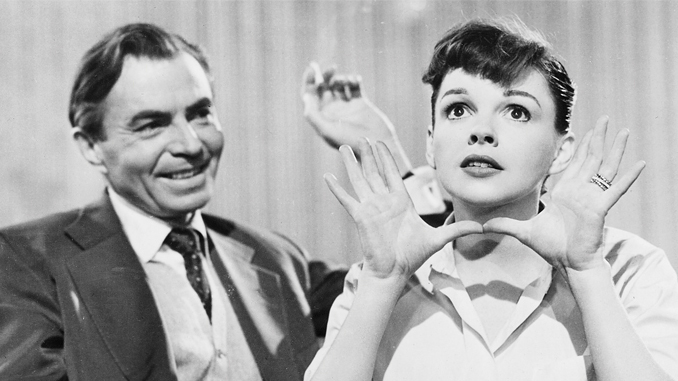 Three additional versions, all called A Star Is Born, were filmed — in 1937 as a drama, and in 1954 and 1976 as musicals. In 2012, Clint Eastwood briefly announced another remake starring Beyoncé, which reportedly is still in development. For the 1976 version, executive producer and lead actress Barbra Streisand changed the characters from movie stars to rock stars and sought Presley but settled for Kris Kristofferson as the male lead. The most enduring version, however, is the 1954 version with Garland and James Mason, which continues to reach new audiences on DVD and Blu-ray and celebrates the 60th anniversary of its release in September. The story remains contemporary because fallen and rising stars dominate the news and tabloids to this day. Hollywood itself cherishes the premise of A Star Is Born, in which a self-destructive alcoholic star discovers a new talent, marries her, and commits suicide when he realizes that he will ruin her career and life. The story also fulfills another Hollywood myth: Any girl can be discovered by Hollywood and become an idolized Cinderella, just like Jean Harlow, Lana Turner, Ava Gardner, Esther Williams and Doris Day. of director Tom Forman, who killed himself after suffering a nervous breakdown. The film, which was directed by George Cukor, concerned a waitress (Constance Bennett) who is molded into a star by an alcoholic director (Lowell Sherman), who later commits suicide. Selznick revised the storyline for the 1937 partial remake, A Star Is Born, to revolve around the self-destructive star Norman Maine (Fredric March), his devoted wife Esther Blodgett (Janet Gaynor) — whom he discovered and made into the star Vicki Lester — and the paternal head of the studio, Oliver Niles (Adolph Menjou). He approached Cukor to direct this version but the latter declined because of the similarity to the 1932 film he had helmed. But it is the Garland version that is legendary because of her electrifying rendition of “The Man That Got Away,” composed by Harold Arlen with lyrics by Ira Gershwin. Arlen also composed her other signature song, “Over the Rainbow” for The Wizard of Oz (1939), one of the greatest musical numbers captured on film. Garland’s third best-known song, also from A Star Is Born, is “Born in a Trunk,” composed by Roger Edens, who was her musical mentor at Metro-Goldwyn-Mayer. George Cukor was a superb adapter of Broadway plays to the screen, but admitted that he had little interest in musicals. After 15 years with MGM in an unbroken string of classic musicals, the 28-year-old Garland was fired by the studio for her substance abuse problems and unreliability. After being replaced on three musicals — The Barkleys of Broadway (1949), Annie Get Your Gun (1950) and Royal Wedding (1951) — because she failed to report for work, she was released by both the studio and her husband at the time, director Vincente Minnelli. Why did Garland choose A Star Is Born for a comeback? Perhaps she wanted to show MGM that she could be a producer and star of an Arthur Freed/ Vincente Minnelli-style musical without them. She loved the story ever since she had appeared in a radio version of the movie in 1942. MGM studio chief Louis B. Mayer had agreed to a remake at the time, but his boss, Loew’s president Nicholas Schenck, refused because it was too downbeat. Soon after, her addictions caused her to become her own version of Norman Maine. At one point in the story, Mayer sent Garland to rehab in 1949, just like Niles did to Maine. By 1951, Garland had married Sid Luft, who managed her hectic concert and recording career. 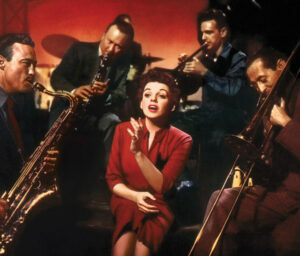 When the movie rights to A Star Is Born were sold by Selznick to producer Edward Alperson, Luft and Garland entered into partnership with Alperson in 1952 to remake the movie with the newly created Transcona Enterprises, which made an independent deal with Jack Warner to fund the movie, to be produced by Luft, and release it through Warner Bros.
British bad boy Errol Flynn, Warner’s star for 15 years, was the new model for Norman Maine. 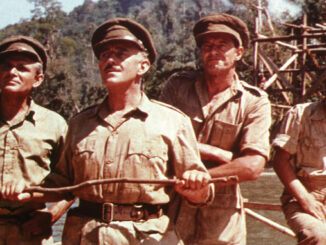 Garland originally wanted Laurence Olivier, Richard Burton or Cary Grant before James Mason was signed. One of the most accomplished actors of his time, Mason could express the delusional nature of a male star depressed by bad formula movies because he had resisted being seduced by Hollywood. Luft hired Moss Hart to write the screenplay and, ironically, Cukor to direct. Because the director and writer loved Garland, they enabled her unreliable behavior. Hart followed the 1937 screenplay by Robert Carson, Dorothy Parker and Alan Campbell, but he wrote some unnecessary plot diversions involving Maine. With the musical numbers added, the film was overlong. Cukor was a superb adapter of Broadway plays to the screen, but admitted that he had little interest in musicals. No songs were written for the other characters, so the result was a musical in which only the female star sang. When filming was complete, Warner realized that there was no big production number that revealed why Vicki/Esther (Garland) became a star. Cukor had already departed the production to prepare Bhowani Junction (1956), so Richard Barstow choreographed a production number to “Born in a Trunk,” which added even more time, but centered the film. The film premiered at 196 minutes, which was cut down to 182 minutes when released for its first run. Exhibitors demanded the film be cut to a normal running length. 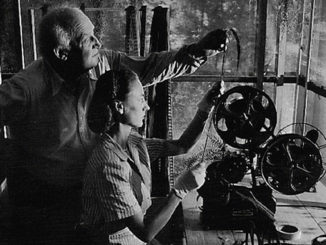 Editor Folmar Blangsted, under Warner’s direction and without cooperation from Cukor, cut out 27 minutes to achieve a still-long exhibition time of 155 minutes. Because the film was already in the first-run theatres, an agreement was reached that the shortened prints would be shipped and substituted for the long version. Blangsted excised reels or combined reels rather than do a full re-editing job with re-recording. Most of the 27 minutes involved superfluous scenes of Maine not being able to get Esther a screen test after she had quit the band at his urging because he was on extended location shooting. She becomes a carhop until he gets her a test. Another scene cut was Maine’s proposal to Esther on a sound stage, where she is recording a song, and the crew hears the proposal on an open mic. The song “Lose That Long Face,” a lifeless imitation of similar numbers in MGM musicals, was also cut; it was to bracket an emotional breakdown by Vicki/Esther before producer Niles in her dressing room. The laughter-through-tears transition from sound stage to dressing room and back was not needed because it trivialized the raw emotions revealed by a woman who cannot cope with a drunken, unemployed actor-husband who begs Niles to rehire him. Garland was still unreliable and failed to appear for filming, causing over a month in delays. The cost of re-shooting a month’s work also added to the budget. Eventually, the $1.5 million budget ballooned to over $5 million, resulting in the most expensive movie Warner had made at that time. Intended to be a top moneymaker, the film grossed just over a reputed $600,000 on its initial release, a financial failure. The film received six Oscar nominations (but no wins): Actor (Mason), Actress (Garland), Set Direction-Set Decoration, Costume Design, Music and Original Song (“The Man That Got Away”). Though Garland was expected to win the Academy Award, she lost to Grace Kelly, who coincidentally also played the wife of an alcoholic actor in The Country Girl (1954). Warner went on to hate Garland for the rest of his life because of the film, and cursed her before Natalie Wood and Robert Wagner when they campaigned for her to play Mama Rose in Gypsy (1962). Curiously, Mason gave the eulogy at Garland’s funeral in 1969. In 1983, film scholar Ronald Haver released a restored version of the original cut of the 1954 A Star Is Born, featuring scene reconstruction from still photographs and soundtracks, and that is now considered the preferred version. He also chronicled the sordid history of the film in his 1988 book A Star Is Born: The Making of the 1954 Movie and Its 1983 Restoration. 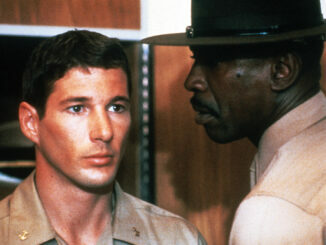 Even if Eastwood’s version never materializes, this story is bound to be remade yet again.